UFC Fight Night: Hunt vs. Bigfoot sent eight fighters straight to the hospital. Fighting carries with it the inherent risk of danger and injury. This is nothing new. Luckily, most nights of action end with some bumps, bruises and cuts. Other nights do not end with such fortune. If you were on UFC Fight Night: Hunt vs. Bigfoot, you might have had one of those nights, the one that ends up with an ambulance ride. More than one-third of the UFC Fight Night: Hunt vs. Bigfoot participants ended their day in the hospital, including half of the main card fighters. The list is headlined by the night’s main eventers, Mark Hunt and Antonio Silva, who were transported immediately after their five-round war. Each man landed over 120 strikes in a battle of attrition that ended in a majority draw. 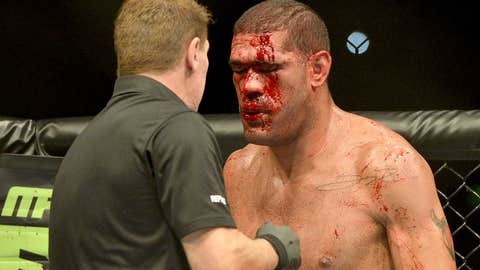 Afterward, Hunt left the arena believing he had a broken hand, while Silva had several cuts that needed to be addressed. They were far from the only ones who needed medical attention. Ryan Bader was taken for a hand injury while his opponent Anthony Perosh was transported for precautionary reasons after absorbing a one-sided three-round drubbing. Pat Barry was taken to be checked out after being knocked out by Soa Palelei, while Dylan Andrews had to have a shoulder injury looked at. Those six names comprise half of the main card fighters. Prelim opponents Nick Ring and Caio Magalhaes were the only undercard fighters that were sent to the hospital, although their injuries were unclear. All in all, eight of the 22 competing athletes could commiserate while licking their wounds. In addition to all of that, female bantamweight Julie Kedzie announced she was retiring after losing a close split-decision to Bethe Correia.